9 Top Luxury Apartment Amenities: Which Ones are Your Deal-Breakers? When you're searching for a new luxury apartment, what features do you specifically look for? 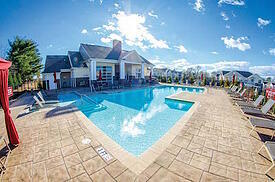 Different apartment communities offer different combinations of amenities. You may not be able to find everything you want in one home, so it's a good idea to know which features are your deal-breakers. Here are some of the more popular amenities found in the best apartment communities. Lugging your clothes back and forth to a laundromat consumes a lot of time and money. While on-site laundry rooms are helpful, in-home washers and dryers are the ideal solution. A resort-style swimming pool serves a couple of purposes. You can use it as a fitness tool for swimming laps or doing water exercises, or you can lounge poolside on a warm day, cooling off with a quick dip. If you do a lot of entertaining, having access to a clubhouse or lounge gives you flexibility for planning your get-togethers. Sometimes just finding a community that accepts pets can be a challenge. If you find one with a dog park, you know that your pet is truly welcome. This may sound like a no-brainer, but there are many communities that require residents to use street parking. In densely populated urban areas, there's a good chance you will pay a premium for a parking spot. You might not think your apartment entrance is a big issue. But just think about how much more pleasant your home would be without people constantly walking through the halls outside your apartment. Physical activity is an important part of a healthy lifestyle. Having a community fitness center can save you a bundle in gym memberships and fees. You'll also be less likely to using the excuse that you're too tired to get there. In these days of automated customer service phone lines, it can be a real pleasure to have access to a live person when you need help. Absentee management can turn even simple problems into emergencies. An on-site team can also assist with matters such as package deliveries. Balconies and patios add to the size of your apartment while allowing you to enjoy your own private "backyard." Our Springs communities are designed with the maximum comfort of our residents in mind. See for yourself when you stop in and take a tour. What is the one amenity that you absolutely can't live without? Share your answer in the comments!